The “Gastronomy” exhibition is aimed at all food lovers, children and professionals. We cook in the museum, we inspire love for the trade. 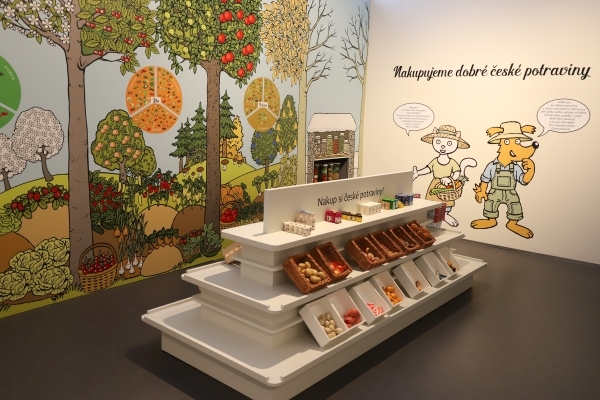 In the children’s gastronomical playroom the very youngest visitors to the museum can try their hand at shopping, cooking and handling food, and find out why it is good to buy local products. They will learn about the kitchens of our grandmothers and great-grandmothers, which are equipped with authentic objects from the museum’s collection. Children will not only learn to recognise food by sight, but also by using their other senses. And last but not least, they will discover the principles of good table manners. Even though the gastronomical playroom is aimed primarily at smaller visitors to the museum, curious and playful adults will also find something to their taste. The Gastronomy exhibition also includes a gastronomy studio, a professionally equipped modern kitchen, where visitors can watch the action inside through a glass wall and on two screens. The gastronomy studio is a training venue of the Association of Chefs and Confectioners of the Czech Republic, where a national team practices for the international competitions in which they represent our country. The Marie Sandtnerová Culinary Institute organises cooking courses and themed workshops in the gastronomy studio under the guidance of top chefs and confectioners. You will find the Gastronomy exhibition on the third floor of the Prague building of the National Museum of Agriculture.